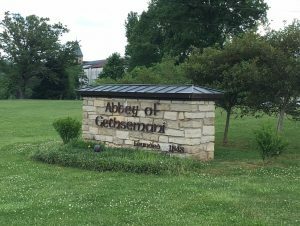 A week ago Monday I pulled into the grounds of the Abbey of Gethsemani, a Trappist monastery set in the beautiful rolling hills of Western Kentucky. Gethsemani is home to brothers of the Cistercian Order of the Strict Observance. 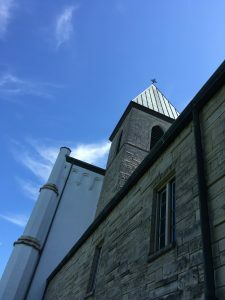 At Gethsemani the monks (including author Thomas Merton until his death in 1968) continue the monastic disciplines of prayer, silence and labor as it has been practiced there for the past 170 years and around the world for nearly a millennium. For ordinary people like me the Abbey provides a place where one might sample a period of silence and reflection, and so I had come. Be prepared to be silent. There are specified places for talking, but signage nearly everywhere reminds one of the rule of silence. Shocking as this may be to us used to constant noise, it IS a balm to one’s inner introvert. Be prepared to be silent. I know. I already said that. But your hosts mean it. You will find yourself wondering whether to say things like ‘excuse me’ and ‘thank you’ (you may). You will need to suppress the urge to ask others for their names and hometowns and stories. They will remain strangers. But they are there to hear from God, not you. So, as much as this is a challenge to your inner extrovert, be silent. Be prepared to be well fed with three precisely timed (7:00, 12:30, and 6:00) meals of simple and wholesome food. Be prepared to not find beer. These are not the Trappists who brew. These ones make fruitcake and fudge. Sorry. Be prepared to look at these men as if they are some kind of zoo animal. (“O, look! There goes one!”) Monks are rare, after all. Be prepared to climb. There is an elevator that serves the newer portion of the retreat house, but it is so slow that I fear if I entered with a green banana on the ground floor it would be rotten by the third. To get a cup of tea from my room required 140 stairs. I counted. Of course I did. Be prepared to be drawn into these rhythms of prayer and psalm. I found myself at times checking my watch so that I might sit in the back of the church and bring my own heart and its concerns to their scheduled times of prayer. Be prepared to be different – to not like it. Some of us don’t like silence. Some of us reflect better in a library surrounded by books or in a coffee shop with a laptop than we do sitting in a garden or in a church. That’s okay. Be prepared to sleep. It’s not being lazy. It’s called rest. I left my ‘cell’ early Friday, summoned by the 3AM bell, trudging down 70 stairs and out into the darkness and back to the ‘real’ world. I left having grown fond of the place in spite of its oddities. And I left sent on my way by prayer, by men devoting their lives to that “useless” endeavor. Did you know that Bill Schickel designed the chapel? I did NOT! Add that to the list of things that I did not know while I was there but wish I had. So glad you had a restful time, Randy! Got me wondering if there is a monastery for women anywhere. I’ll have to look into that! Probably half the ‘retreatants’ (as we were called) were women.